Happy Birthday, Amanda Jean! I love the pincushion you gave me. xo. Lovely pincushions! 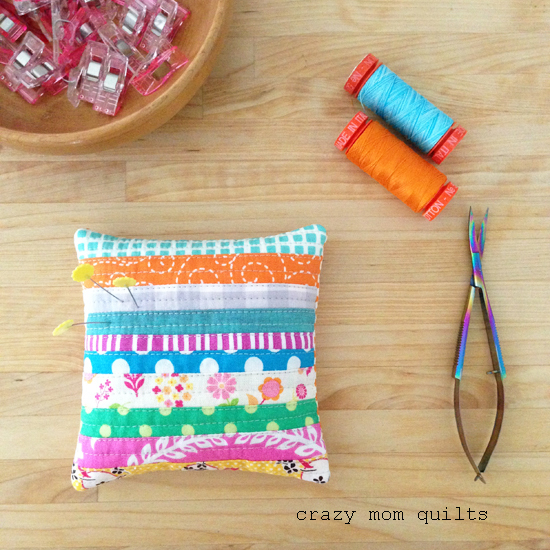 I am wanting a small project to tackle, and a pin cushion sounds like the perfect thing! I love them all and I'm sure by the end of the month there will be enough room in my heart to love 25 more! 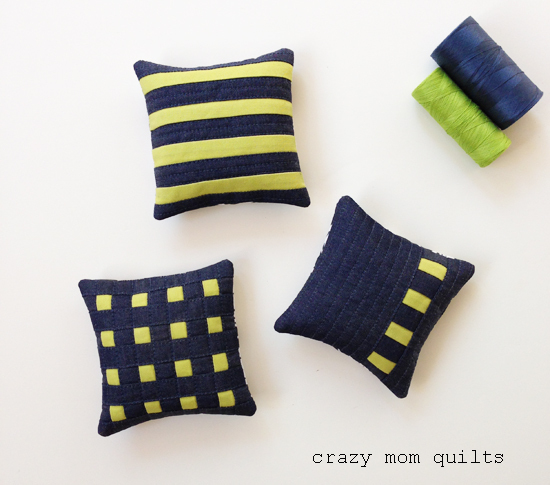 :) I made a pin cushion last week...pretty fun- it is VERY similar to your navy and lime ones and is 4x4. Can I ask a question? Do you just sew them right sides together, leaving a hole to fill then stitch up by hand? Cute pincushions! Can't wait to see the next ones. These are so fun!!! I am so excited to see these throughout the month ;) And I hope you had a very Happy Birthday!!! I think I'd make more, but the fussiness of hand stitching them closed gives me anxiety! These are so lovely! Your friends are very lucky! How fun! These are all beautiful! Happy birthday! There's nothing like a dose of your pincushions to brighten the day! I really love pincushions. And yours are so sweet. Thanks for all the ideas. 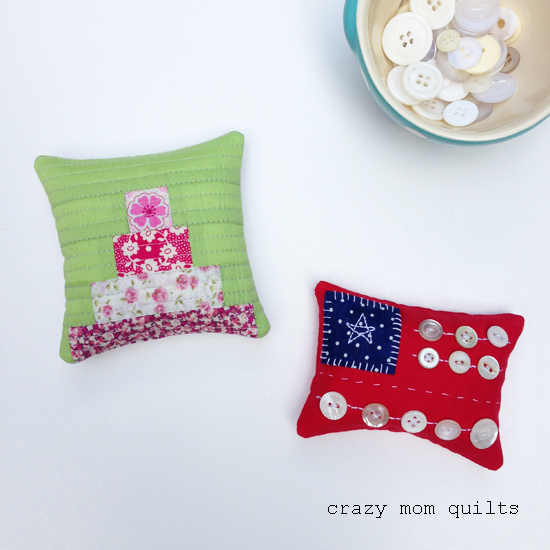 I'm in a constant pincushion swap with Bea, and I needed some new ideas. What a great way to celebrate July. What a wonderful start to the month. There's just something about tiny blocks that are so stinkin' cute! I look forward to seeing your creations daily on Instagram. I am a little late with my wishes for you to have a happy birthday, I hope it was an enjoyable day for you. Not all of us have fireworks celebrations on our birthdays, pretty special I would say! Amanda Jean these are so cute. As I scrolled through the post, I saw the first on and said that was my favorite, then no the second one, no the third one. They are all so adorable. I've never made a pincushion. I'm a new quilter and the tiny pieces scare me. Maybe one day! I can't wait to see the rest of them. CRazy ! I love it ! Hope you had a Happy Birthday ! Can you do a tutorial on HOW to make one of these? For those of us too scared to sew a piece less than 2.5" square? Very cute.....happy belated birthday too. What a fun challenge! 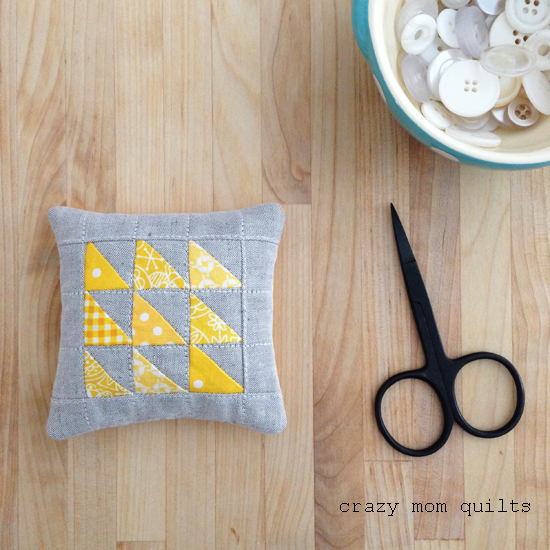 There is no end to tiny, scraps and perfection...all packed in to one little 'pillow'! It makes me want to fill a basket full. Thanks for the tip on the walnut shells. I never would have thought to look at a pet store! This is such a fun idea. I can't wait to see the whole gang gathered for a photo shoot! Great challenge for July. Can't wait to see the rest. 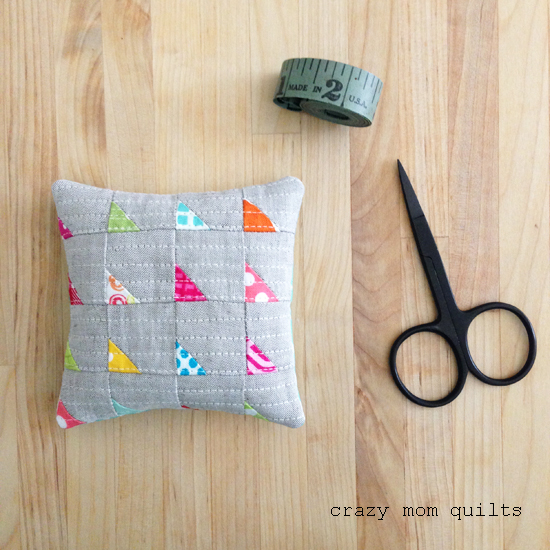 I looked back to your mini-9 patch pincushion tutorial and see that you use 1/4" seams. Do you trim them down to reduce bulk? They are all so cute and would make lovely gifts. Belated Happy Birthday. Happy Birthday! My daughter turned 15 on the 4th -- it's an interesting birthday to have. I only began sewing two months ago -- I am working on my third quilt top (Very proud of my first completed quilt), but I may need to set that aside to try your 9 patch pincushion. Thanks for all the inspiration. How about a pincushion Dresden Plate?! I find myself oddly attracted to that shape. So you get fireworks on your birthday every year! That's awesome--and I'm a little jealous. I share a birthday with George Washington but we've never had fireworks as far as I know. I love, love those pincushions! All of 'em! My fav is the navy one made from the leftover scraps. Talk about using every inch of scraps! They all look like cute, tiny, perfect pillows! These are so fun and varied. You are quite talented! I love the idea of walnut shells but I have a nut allergy. Do you know of anything like it that would work but isn't going to get me all itchy? Anyone every try heat-dried corncobs instead? I'm wondering if this will do the job too? Thanks for some great ideas! I love making pincushions too. I loved everything about this post! Thanks for sharing your pincushion journey. I'm in love! I think the cake one is the sweetest! I haven't been able to find the crushed walnut shells near me, what's another filling? I love all your tiny scraps things! Of course, I love the pincushion parade but I also love when you share that certain projects are buggers and involve ripping. I appreciate that you are keeping it real. Happy birthday again! I have to say those are the cutest pincushions I have ever seen!